I mean musical ability - the level which life-long pianists or violinists achieve - is thought to be one of the most superfluous adaptation. Apparently a bump on the ol' noggin can replicate the lifelong efforts of your vaunted musicians. Certainly, Jorge, and I remain curious about how we can achieve those same abilities without injury or drug. You have to understand, I spend most of my days reading things pertinent to my academic field - not that I don't try and have a pretty good interdisciplinary context. Ideally, I'd like to aspire to and believe that the Renaissance Man is still achievable in our world. For instance, I could probably point out to you most of the other documented cases of this nature. After all, there are probably fewer than a couple hundred documented cases of brain injury that yield to selective loss, especially virtuoso abilities, without complete cognitive degeneration, and those individuals are quickly monopolized by individual institutions, forever, according to strict research methodology. I'm willing to suggest that, perhaps, your example has relevance. But the quote you've used there was actually a commentary on reductionism and evolutionary psychology. I thought you were suggesting that everything "we" as conscious experiences "do" - of our own volition as it were - is something of an epiphenomenon in relation to the "4F" brain, grinding along, doing what it needs to do. In that context, I offered the suggestion, in that very quotation, that its theorized in the cognitive sciences - those taking this "I" as it's subject - that learning an instrument, or as jvj so well put it, learning "any ability humans tend to decide to spend a long time getting good at, and that does not seem to enhance said humans genetic fitness in any overt fashion," is not something the "4F" brain would do. I'm inclined to think that if you take an individual who is addicted to heroin but broke the habit - if one were to go back in time and inhibit the concious brain (ie, the brain that kinda detects and thinks about/performs functions in regard to the rest of the brain) in that individual, then they would not break the habit. They'd be utterly locked in, as I imagine most animals would be (can animals break a habit if given some amount of access to what they are addicted to?). Caveats: Lots of people don't break habits. Also how'd he get addicted to begin with if the concious brain is sooo great? But other than those caveats, it seems it does have a chance at interupting behaviours. I dunno if I'm slipping off topic in raising this idea. I think, in fact, you've hit another nail, Callan. Heroine is an interesting case because of its speed and efficacy. In the near future, the paradigm is set to shift to a framework that suggests all addiction is relatively the same in rudimentary function, different in degree. While Bakker's metaphor of the Steppe is a better one than he probably realizes, I'll give you a more common one in the literature. Neural networks are like rivers. At first they have to wear a path across the ground, or brain, literally any path, but a path. But there's a threshold that is passed and where once the water wore a path, now the ground dictates its passage, or your words and actions. So it is with, well, all the imaginable and so far unimaginable human cognitive habits. People are lazy, Callan, mentally and physically. They look for any excuse not to utilize their agency in the world. Why? Innumerable reasons we could theorize. I prefer to go down fighting. I thought you were suggesting that everything "we" as conscious experiences "do" - of our own volition as it were - is something of an epiphenomenon in relation to the "4F" brain, grinding along, doing what it needs to do. OK, I kinda get what you're getting at. Here's my thing... I don't doubt that the stuff our pre-frontal cortex does 'on top' of the four Fs is important. You don't evolve a highly convoluted, energetically demanding, and anatomically impractical organ unless it is important. What I am saying is that the subjective feeling of "volition" is very likely an epiphenomenon of those higher processes, not just the 4 Fs. I think, Jorge, if you have some time for some more dense pleasure reading, that you'd enjoy The Mind & the Brain by Jeffrey Schwartz. So you take exception to your conscious agency. Let's bring it back to a couple threads of topic. Firstly, sadly, I see Bakker's BBT as a kind of idealized scenario. There are - I keep feeling the need to say hundreds or innumerable - many different ways in which your sensual perceptions are feeding "you" information that you do not possibly perceive, as Bakker highlights. In many cases, the research is pointing towards even more complex multisensory perception, along with its own biases. Bakker presents certain absolute thresholds without actually quantifying them. We're nowhere near his problem of recursion because we can still mediate the Blind Brain Effect to a certain extent. We can all train ourselves to be more aware of more of our senses - too an imaginably obscene degree - developing the recursive brain structures for a long time before actually hitting the limitations imposed by the BBT. Secondly, I'm curious as to your opinion on nootropics and neurocosmetic surgery, especially within your perspectival framework. I know many academics who currently synthesize what are called "stacks" for themselves - essentially, eating tens of pills each day in order to achieve certain enhanced cognitive states. They're like the garage inventors of Bakker's Semantic Apocalypse. For my part, I've tried to isolate certain actionable neuropractices in lieu of nootropics or neurocosmetic surgery. Apologies, by the way, Jorge. I had meant to return to this thread and offer an explanation of The Mind & the Brain. Ever since Kalbear called me on just throwing titles out there, I've tried to be more conscious of when I use examples in discussions like this. In the Mind & the Brain, Schwartz chronicles his formulation of talking therapies to treat severe forms of Obsessive-Compulsive Disorder. His research is in many ways responsible for part of the flood in neuroscientific research during the past decade. Essentially, he showed, repeatedly, that it was possible to treat OCD - something we've formerly treated with chemicals, surgery, or shock therapy, depending on how far you follow the literature back - with nothing but abstraction and volition on the part of the patient. Now he also constrains any conscious volition, what he calls Directed Mental Force, to about 200 msec between when the deterministic brain decides to do something and when "you" do something, where you have the momentary ability to veto. to about 200 msec between when the deterministic brain decides to do something and when "you" do something, where you have the momentary ability to veto. Here's my problem with this. There's no difference between "deterministic brain" and "you". Nonetheless, the fact that OCD can be treated via non-pharmacological means is intriguing. I will definitely read this book when I get the chance. I hear you. All I can say at this point is that the clear difference between deterministic brain and "subjective you," let's call ourselves, is about 700 msec, if I remember the research correctly. A computer records instances of PET and fMRI scanners while the subject is told to lift a finger at anytime and mark when they "felt" they willed their finger to move. This is what makes chronometric studies so interesting in psychology, especially with the advent of brain imaging - though many pioneers in psychology found ways of reliably making distinctions before this - is that it's a tool for measuring cognition grounded in biological time. There are just so many avenues of research, new and old, in which to provide more context for these results. Obviously, we're well into the theoretical weeds here. 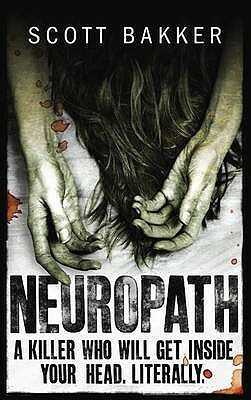 Can anyone tell me what the connection between Neuropath--specifically this cover--and this book is? Those are the same pictures of the hair and hands on the covers. Yup those are the exact same person. Google says the german title translates to "shell cracker"
Maybe the two authors listed on the 2nd are translators of Neuropath? Otherwise, seems like one of the publishers copied the other, which smells of copyright infringement, unless it was some willful collaboration. Wonder which cover came out first? There's also a possibility that they just took the same stock photo. Wouldn't be the first.